Posted September 20, 2018 by Sheri Bell and filed under the categories Apologetics, Straight Talk, Stuff for Teens, Talk for Today. Last week, in Part 1 of this topic, we talked about the importance of our having a right attitude when interacting with skeptics. I reminded you to let go of the “fight” mentality when challenged on your beliefs; to instead view these encounters as God-ordained opportunities to demonstrate the truth and love of Christ. Lastly, we talked about the important of asking questions, to help identify why the skeptic holds his views. Is their beef really with God…or humans? So what are some of the common objections raised by skeptics? Natasha Crain does a great job of identifying a good number of them in her blog post titled 65 Apologetics Questions Every Christian Parent Needs to Learn to Answer. ~What key arguments are there for (and against) God’s existence? ~Why would a good God allow evil to exist? ~How can a loving God send people to hell? ~How can Christians say Jesus is the “only” way? ~Am I good enough to go to heaven? ~Is Christianity a less intelligent worldview than atheism? ~What evidence exists outside the Bible that Jesus existed as a historical person? ~How were the books of the Bible selected? ~Is Christianity “responsible” for millions of deaths throughout history? ~Why does Christianity say objective truth is the only “real” truth? Another good place to research questions and answers is in the books and on the websites of today’s top Christian apologists. 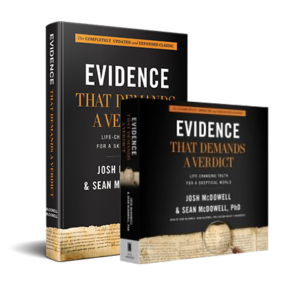 Start by perusing the weekly blog posts in this “evidence” series, based on Josh and Sean McDowell’s revised apologetics classic, Evidence That Demands a Verdict. But also learn from apologists Ravi Zacharias, J. Warner Wallace, Frank Turek, Gary Habermas, and Natasha Crain. Nabeel Qureshi, a gifted speaker with many videos on YouTube, also authored several impactful books on witnessing to Muslims that you might find helpful. And you’ll find many short, insightful videos on Sean McDowell’s website, each offering a concrete answer to questions often raised by skeptics. Again, as you research and become practiced with answering these questions, don’t make it your goal to “win” against skeptics. Rather, make it your goal to help them understand why your belief in Christ isn’t based on mindless, “blind faith,” but substantial, historical evidence. >>> 1: Develop the habit of critical thinking — which goes way beyond knowing Bible stories and memorizing Bible verses. We need to have thought about our beliefs, and know why we believe them. We need to be able to make connections between things Jesus taught and how they’re still applicable for our modern lives. We need to be able to explain why a particular scientific theory doesn’t hold up — and why it might not really be all that important whether He created the universe in 6 days or 6 million years. We need to know what archeologists have proven historically about the Bible. We need to be able to explain the Trinity. Trust me, skeptics will ask. >>> 2: Remember that not every claim or fact uttered by a skeptic is true — particularly when it comes to the historicity of the Bible, or a scientific “fact.” On the converse, don’t lose credibility by spouting your own half-truths! We have the right to be just as skeptical as the skeptic, and to ask for objective proof. A common argument used by skeptics is that Christianity “borrowed” its theology from other religions. But when we actually research that claim, we see that, in fact, it’s the other way around. And remember that it’s NOT on us to prove God’s existence — and here’s why: no skeptic or atheist has yet been able to disprove God’s existence. In suggesting that we have to prove God’s existence in order for them to change their minds, skeptics are attempting to hold us to a standard they, themselves, can’t reach. So when atheist Richard Dawkins writes, “If you want to believe in…unicorns, or tooth fairies, Thor or Yahweh—the onus is on you to say why you believe in it. The onus is not on the rest of us to say why we do not,” his argument doesn’t hold up. Too, when we read books by atheists and skeptics, we have to be cognizant of their bias. 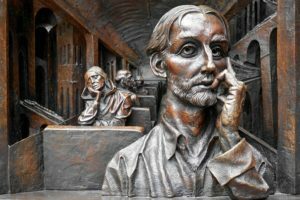 The content in Richard Dawkins’ book, The God Delusion, for example, might sound utterly convincing to you — until you also read books that dismantle Dawkin’s case against God. Debates between the two camps offer immediate comparison. Here’s just one of the many you can view, courtesy of YouTube: William Lane Craig vs. Christopher Hitchens – Does God Exist?. Again, we have to recognize whether the skeptic challenging us is coming with an open mind — or is simply seeking to waste our time. I am happy to talk about God with people who truly want to have an authentic conversation. But if a committed atheist wants to chat for her entertainment or agenda, I’ll pass. I am not goaded by the “Prove God exists” challenge when I recognize it’s being used to manipulate me. How ’bout you? >>> 3: Commit to having a humble attitude when dialoguing with skeptics. Even if we’re mocked, even if we’re told we’re stupid, we get to choose how to respond. Christ left His ego behind, and asks us to do the same. Witnessing isn’t about winning. It’s about showcasing Christ. Truly, if we’re not evidencing the nature of Christ in our lives, what’s the point of even dialoging with skeptics? To drive this point home, let’s look at two sample conversations between a skeptic and a Christian. I leave it to you to rate each performance with gold stars — 5 for great, 1 for poor. Be able to articulate why you came up with your score. My own scores and thoughts will follow Conversation 2. Conversation 1. I give the Christian one gold star, for being minimally effective. The Christian clearly isn’t familiar with the Bible, is condescending, and pronounces judgement on the skeptic. Yowza! How does that help to keep that skeptic open to further conversations? Conversation 2. I give the Christian five gold stars, for being very effective. The Christian appears to be informed, respectful, and sincerely desiring to listen and respond to the critic. Offering to buy coffee for the critic was a kind, generous gesture. But God gave me the brain I have, so I have to work with it. HA! I have found it helpful to create a little apologetics notebook that I can refer to as an ongoing refresher. I’ve also found it helpful to create a computer document of links, that I can go back and peruse or print out. And on my lunch breaks I often use that time to watch YouTube videos of the apologists I mentioned above, to watch how they phrase things. Consider what tools you might use to help you memorize or quickly retrieve information you need to answer skeptics.